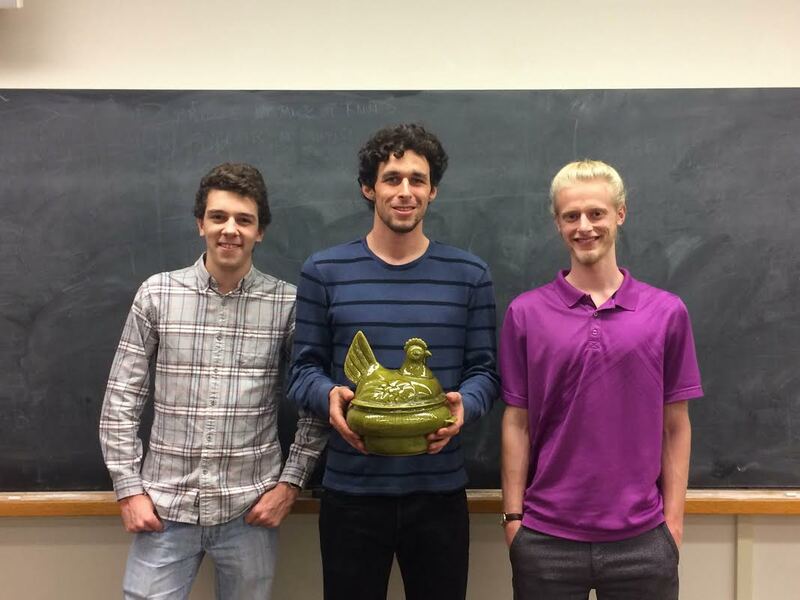 Williams » Mathematics & Statistics » Williams College defends the Green Chicken! 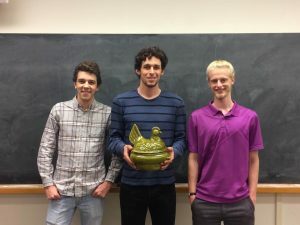 The 39th Annual Green Chicken math contest was held at Williams College on Saturday November 12, with Williams and Middlebury students taking on challenging math conundrums to compete for the beloved Green Chicken trophy. Williams successfully defended the Green Chicken, with Elijah Fromm ’17, Ian Banta ’19, and Abe Leite ’20 valiantly leading Williams’ team! Congratulations to the entire Williams College Math Team and to Professors Ralph Morrison (the coach of the team) and Steven Miller (the co-organizer of the competition)! Many thanks to the Middlebury folks for coming down to Williams, and to all 18 Williams students who participated! We look forward to the Fall 2017 Green Chicken contest, to be held at Middlebury College. The 2016 Green Chicken questions are available here, with solutions here.